Why do you need an Atlanta injury attorney? Because when an attorney handling a lot of cases in Atlanta, he or she can develop a good rapport with the Atlanta judges. It also means that the Atlanta injury attorney can establish a reputation of being a great litigator which helps get the great results you need. 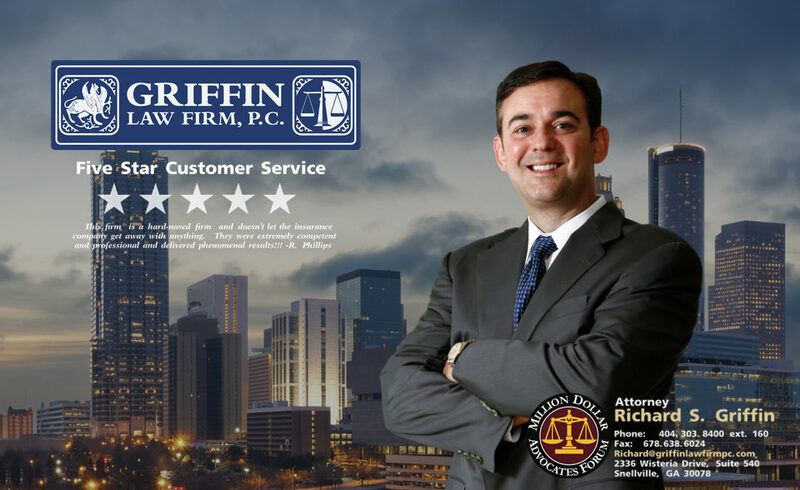 How do you know that the Griffin Law Firm is the right Atlanta Law Firm for you? We recommend you review three areas to know for yourself if our firm is right for you. Client Testimonials: You should read the client testimonials which will show you that our clients are happy with our service and highly recommend us to others. Attorney Awards: You should take a look at the Firm Awards which will show you that we have the highest rating of “AV Preeminent” by the Martindale-Hubble along with a peer review rating of “Superb” on Avvo, and many other prestigious awards. Great Recoveries: You should also review our firm’s settlements and verdicts which will show you that we have a history of delivering great recoveries to your clients. What connections does the Griffin Law Firm have to Atlanta, Georgia? Atlanta Attorney: Attorney Richard Griffin was born, raised, and educated in metro Atlanta, Georgia. He created the Griffin Law Firm to exclusively handle injury and disability claims in Atlanta and throughout the state of Georgia. Atlanta Education and Training: Attorney Richard Griffin graduated from Emory University and from Georgia State College of Law both of which are located in Atlanta, Georgia. Attorney Richard Griffin also worked as an intern for the State Board of Workers’ Compensation in Atlanta, Georgia while he was in law school. This opportunity allowed him to gain invaluable experience and relationships with the judges and staff attorneys at the State Board. Atlanta Law Office: The Griffin Law Firm has an office in Atlanta, Georgia located at 50 Hurt Plaza, Suite 820, Atlanta, Georgia 30303. We also have an office at 2336 Wisteria Drive, Suite 540, Snellville, Georgia 30078. The Griffin Law Firm cares about your case. They have the answers to your questions and concerns. Attorney Richard Griffin even reduced his attorney fee to make sure the attorney fee wasn’t more than what I received from the settlement. I am very happy and recommend this firm. Rating 5 out of 5 stars. They kept me informed by calling me at least once a week. They are friendly people who provide great customer service. Rating 5 out of 5 stars. I liked the way this firm represented me. I never had to worry about what was going on with my case. Rating 5 out of 5 stars. They provided excellent representation throughout my case. 5 out of 5 stars. They have a great staff. They showed concern and did great work for me. 5 out of 5 stars. This firm is courteous and polite. They kept me informed on my personal injury case. I liked everything about the firm, but I especially liked that they kept in contact with me. This firm is friendly and cares about you. Getting signed up was easy. This firm put my needs before theirs. This firm is very honest. They didn’t make decisions without getting my permission. They are very responsive. I recommend them without hesitation. This firm showed integrity and honesty all the way to the bottom line. They took care of all of my needs and even helped me get the medical treatment I needed including a surgery. I was handled professionally and received the best representation possible for my case. 5 out of 5 stars. They were on time and always professional. They really stayed in touch with me. 5 out of 5 stars. They were answered all my calls and were respectful and responsive. They got me the settlement that I really needed. 5 out of 5 stars. This firm was kind and patient, and they got me a great check today! They had a fast response and had a great knowledge of our firm. This firm processed the claim and settlement fast. They are friendly and accurate and got me a great settlement. Very, very nice telephone communication. They got me great results. Atlanta Settlements and Verdicts: The Griffin Law Firm has obtained many great settlements in verdicts on personal injury and workers’ compensation claims in Atlanta, Georgia and throughout the state of Georgia. Atlanta Workers’ Compensation Settlement of $1,178,073: This case involved a catastrophic back injury to an injured worker who was injured in Atlanta, Georgia. This Atlanta workers’ compensation settlement included both the lump sum settlement and the Medicare Set Aside (MSA). Atlanta Truck Accident Personal Injury Verdict of $525,000.00: Our Atlanta truck accident attorneys obtained this jury verdict in Superior Court of Fulton County. Our client required pain management and a lumbar spine surgery. This recovery was especially great in light of the fact that the property damage was only $1,500.00. Superior Court of Fulton County: The Superior Court judges include Chief Judge Gail S. Tusan, Deputy Chief Judge Wendy L. Shoob, Judge Alford J. Demsy, Jr., Judge Bensonetta Tipton Lane, Judge Doris L. Downs, Judge Constance C. Russell, Judge Cynthia D. Wright, Judge T. Jackson Bedford, Jr., Judge John Goger, Judge, Jerry W. Baxter, Judge Tom Campbell, Judge Ural Glanville, Judge Craig Schwall, Judge, Christopher Brasher, Judge Henry Newkirk, Judge Kimberly M. Esmond, Judge Shawn Ellen LaGrua, Judge Kelly Lee Ellerbe, Judge Todd Markle, and Judge Robert C. McBurney. State Court of Fulton County: Chief Judge John R. Mather, Judge Patsy Y. Porter, Judge Myra H. Dixon, Judge Diane E. Bessen, Judge Fred C. Eady, Judge Jay M. Roth, Judge Susan E. Edlein, Judge Wesley B. Tailor, Judge Jane Morrison, and Judge Eric A. Richardson. Magistrate Court of Fulton County The Magistrate Court judges include Judge JoAnn Bowens, Judge Karen Woodson, Judge Richard E. Hicks, and Judge Walter Lovett. Atlanta Workers’ Compensation Court: All workers’ compensation claims in Atlanta or anywhere in Fulton County are tried in the State Court of Workers’ Compensation of Georgia. The administrative workers’ compensation judges in Atlanta, Georgia include the following: Chief Judge David Imahara, Judge Viola Drew, Judge Stephen B. Farrow, Judge Meg T. Hartin, Judge Elizabeth Lammers, Judge Johnny Mason, Judge Andrea Mitchell, Judge Vicki L. Snow, Judge Charles Spalding, and Judge Carolyn S. Weeks.